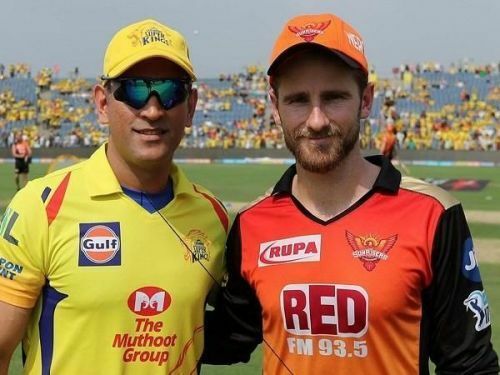 Can SRH finally defeat CSK or will it be the third IPL title for Mahi? SRH defeated KKR by 14 runs to book a place in the IPL final, and will face the Chennai Super Kings at the Wankhede Stadium. On Friday, KKR won the toss and put SRH in to bat first. SRH got a decent start courtesy Wriddhiman Saha (25) and Shikhar Dhawan (34), and scored 45 runs in the power play without losing a wicket and set a platform for the batsman to come. Kuldeep Yadav was asked to bowl the eighth over and it paid off as he dismissed both the key men, Shikhar Dhawan and Kane Williamson (3). Thereafter, Saha and Shakib Al Hasan (28) built a 24-run stand. After Saha's dismissal, SRH collapsed to 138/7 in 18.1 overs. Rashid Khan scored 34 runs in just 10 balls and took the score to 174 from a position where people thought that 150 would be hard to get. Kuldeep Yadav (2/29) was the pick of the bowlers, while Shivam Mavi, Sunil Narine and Piyush Chawla picked up a wicket each. Prasidh Krishna had a rare off day as he went for 56 runs in his 4 overs. KKR got a solid start as they reached to 40 in just 3.2 overs. Sunil Narine (26) and Chris Lynn (48) were explosive from the get-go. Nitish Rana (22) contributed but failed to carry on after being dismissed due to a run-out. KKR crumbled to 118/6 from 87/2. Shubman Gill (30) looked like he could take the game deep and win it for KKR but Carlos Brathwaite had other plans as he dismissed him in the last over of the match. Rashid Khan (3/19) was superb, Siddharth Kaul (2/32) and Brathwaite (2/15) were brilliant at the death. Rashid Khan was adjudged as the Man of the Match for his all-round display. If you don’t want to include some of the players in the aforementioned list, you can select some from the alternative list. Ambati Rayudu (CSK): The Guntur-born batsman has been a revelation for the Super Kings this season. He has scored 586 runs in the tournament at a strike rate of 153. He has been one of the most reliable players when it comes to getting points. His Golden Duck in the last match was a rare one and expect him to come good in this high pressure match. Kane Williamson (SRH): The Kiwi skipper would have been a doubtful starter in the playing XI if David Warner wasn't banned. But after his suspension, Williamson was handed over the captaincy and he has relished the responsibility. He has amassed 688 runs at a strike rate of 143. He is the most reliable captaincy option for fantasy users. Shakib Al Hasan (SRH, Differential captaincy option): A lot of the fantasy users will have the likes of Rashid Khan, Kane Williamson and Ambati Rayudu as their captains. The Bangladeshi can get you a bucketful of points as he bats in the top 4 and bowls 3-4 overs. He will be a very good option as your fantasy captain. If you want a differential option in your captaincy department, Shakib is the best.